The Mariana Mallard is an extinct species of mallard that lived only on the Mariana Islands. 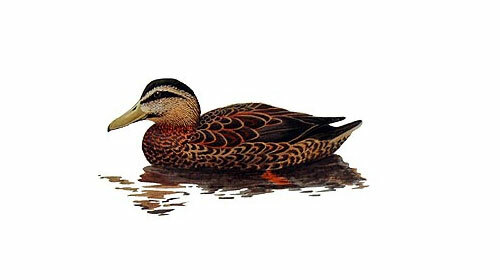 The Mariana Mallard is classed as part of the Anas genus however its taxodermic status is open to debate. Over the years debates have ranged about the Mariana Mallard with some claiming the Mariana Mallard as a subspecies of the Indian spot-billed duck, some favoring the Mariana Mallard to be a subspecies of the Pacific black duck while others believe it to be a stand alone species. Living exclusively on the Mariana Islands the Mariana Mallard is thought to have migrated between islands such as the Saipan, Guam, Tinian and possibly even the Rota island. The reports of Mariana Mallard on Rota are unconfirmed and and allegedly reported two unidentified ducks, not necessarily the Mariana Mallard. Mariana Mallard’s weighed in at around 1 kilograms and grew to around 55cm in length making them slightly smaller than common mallards. As is the case with male mallards, the male Mariana Mallard had a green head that was not as bright as today’s mallard. Generally chestnut in color the Mariana Mallard sported light gray feathers on its underside and had a dark bill that reached a rich olive coloration at the front end. The mix of coloring gave the Mariana Mallard a distinct look similar to that of a Pacific black duck but with a lighter underside. The females of the species looked like today’s female mallards with dark brown feathers and orange feet similar to the males.